Many of you have read my various tickers over the years on One Dollar of Capital, including this one from 2009. 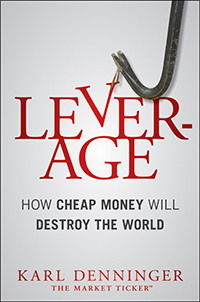 This also features prominently in my book Leverage; indeed, quite a bit of ink was spent on this very topic. I am continually asked by various policy-makers to define exactly what I mean by this standard, as it appears that the various previous Tickers are not sufficient for clarity. Thus, the definition set forward here. One Dollar of Capital is simply the principle that nobody be permitted to "create credit out of thin air", thus artificially expanding the spendable supply of "money" in the system. This, and only this, is the reason for all of the bubbles and financial collapses throughout history. This sleight-of-hand is why Tulip Mania happened, it's why we had a crash in 1873, it's why we had a crash in 1929, it is why the tech market blew up in 2000 and it's why we had a crash in 2008 in housing. It is why we're threatened with collapse in Europe now. It is a scam as old as the money changers during the time of Hammurabi, and until we stop it there will never be stability in the banking and financial system. This sleight-of-hand is in fact exactly identical in mathematical and economic impact to counterfeiting of the nation's currency, a crime which we all should recognize, condemn, and when it occurs the punishment should include both imprisonment and forfeiture of every dollar of ill-gotten gain. Putting a stop to unbridled credit creation also removes the threat of "inflation" because it makes inflation by sleight-of-hand flatly impossible. It returns the ability to cause inflation to the one place where it should rest -- the entity that is supposed to be in control of the money supply, the federal government (specifically, Congress.) We have in fact had monstrous inflation over the last 30 years; one need only look at the increase in the price of stocks, of college educations and medical services to see it. The bankers and their cronies have tried to hide its impact on the common man through offshoring of labor so as to hold down "prices" in the CPI, but that's a lie too as a man who loses his high-paying job to some slave in China has his spendable income destroyed at the same time as he gets "lower prices" at WalMart. Simply put, for every dollar of alleged GDP there must be one of dollar of credit or currency with which to buy the goods and services produced. If you increase the denominator, that is, the number of units of either credit or currency in the system then each unit must inevitably be worth less than it was before. Only when those units are exactly in balance with economic output is there zero inflation and protection of the currency's purchasing power. That is the definition of Sound Money. So mechanically, how do we get to One Dollar of Capital? Banks are limited to depository institutions. They are forbidden to speculate or trade in asset markets. In short, they are effectively what they were back during Glass-Steagall; they take deposits and make loans. Deposit insurance is limited to these firms on their deposits -- and only deposits, not money market accounts and not debt issued them -- and exists only as an assurance against government malfeasance. Investment banks can trade, be involved in in the capital markets or whatever else they wish. However, they are forbidden deposits, government-backed insurance of any form or any sort of public assistance. Again, this is similar to what everyone had to deal with before Glass-Steagall was repealed. All institutions must mark-to-market every night. We have computers, which are very good at counting things. We must use them. No loan may be made beyond either the marked-to-market value of the collateral pledged or the firm's own capital. This forces all lending to be self-liquidating -- either through repayment over time, through seizure and sale of the collateral posted or through the posted capital by the lending institution. For banks if they wish to lend unsecured (e.g. for a credit card) they must have either sold stock to investors in the amount of the loan (and have the cash proceeds set aside), have sold bonds to investors (and have the cash proceeds set aside) or have retained earnings that they set aside. A secured loan (e.g. a letter of credit, a home mortgage for less than the home is worth, a car loan for less than the depreciated value of the vehicle, etc) may be made without capital being posted as the security is the capital. However, since any asset may depreciate in value (e.g. a car) the assets must be continually marked to the market and if the liquidation value falls below the outstanding balance of the loan the bank must post actual capital for the difference on a nightly basis. We maintain a statutory "zero barrier" on excess actual capital in all institutions that have the privilege of lending against assets, at a level high enough to prevent a negative equity event from occurring. Only actual cash counts as capital with the exception of Treasury Bills issued at a maturity of 13 weeks or less. The Treasury is authorized to issue and redeem repos on its own for this purpose. The zero barrier should be set somewhere around 6%, the former reserve ratio before Greenspan and Bernanke began tampering with it, and any violation of that excess capital requirement must lead to immediate seizure and liquidation of the firm. Banks and Investment Banks are free to dance as close to this line as they wish, but if they cross it the consequence is immediate business failure. All institutions that lend against assets must publicly disclose all transactions, marks and capital every night. The price of being able to lend against assets, temporarily increasing the supply of credit in the system, is that you must prove each and every day that you are not counterfeiting. Any institution can choose to avoid this disclosure requirement by lending only against its own capital and not claiming asset values "secure" its lending. Since most financial institutions will not want to disclose this information other than depository firms will likely choose to be investment banks and lend or finance only with the capital they actually raise. Note that a move to One Dollar of Capital immediately resolves all derivative concerns, since every underwater position must be netted every night against actual capital. If you cannot post actual capital on an underwater position you must liquidate the position. This instantly de-fangs the derivative monster. Since no institution can "create credit" there is never systemic risk. Deposit insurance would be unnecessary except that we have a 30 year history of the government refusing to do its job and even participating in book-cooking schemes; during the crisis IndyMac allegedly back-dated deposits with the OTS, its government regulator, aware of the practice and in fact the same individual allegedly responsible this time did the same thing during the S&L crisis. Because we cannot trust the government nor can we seem to prosecute government agencies and individuals successfully when their malfeasance results in the loss of customer funds, FDIC insurance must be maintained. With One Dollar of Capital Lehman could have gone broke and it would not have mattered, beyond Lehman. The bondholders and stockholders would have lost some or all of their investment, but since Lehman would have been prohibited from lending or guaranteeing the loan of any money that exceeded shareholder and bondholder equity the damage would have stopped there. Companies go bankrupt all the time; systemic risk only arises when you permit firms to commit acts that on any rational analysis amount to fraudulent emission of "money" such that they can imperil everyone else if their deception is forcibly recognized by the market.